In 1949, General Decarpentry hinted that the propulsive power developed by the hind legs was more important than the advanced position of the supporting hind leg under the body. We often state that one does not benefit from the classical inspiration by repeating our ancestors’ words but instead by questioning and understanding their thoughts in the light of actual knowledge. The thought that greater thrust is created as the hind limb approaches the vertical, is corroborated by advanced research. During the stance, the supporting hind leg produces first a decelerating activity, resisting the gravity that is pulling the horse’s body down, and the inertia that is pushing the horse’s body forward. The combination of both forces can be referred to as acceleration of gravity. The decelerating phase – also called the “braking phase” – commences as soon as the hoof contacts the ground and lasts until the alighting hind limb approaches the vertical. Instead, the second half of the statement, “the more it thrusts the body upward” is contradicted by what we now know. As the limb approaches the vertical and then moves behind the body, the net effect of the hind legs’ propulsive activity is a force in the direction of the motion. Our ancestors believed that the propulsive activity of the hind legs started as soon as ground contact. Based on this belief, the consensus was that the alighting hind leg propels the body upward. Decarpentry realized that the theory was not accurate, but he could not take his idea further. Our ancestors theorized a direct relation between the advanced position of the alighting hind leg under the belly and its ability to propel the horse’s body upward. In reality, it is a more complex and totally different picture. “In horses, and most other mammalian quadrupeds, 57% of the vertical impulse is applied through the thoracic limbs, and only 43% through the hind limbs.” (H. W. Merkens, H. C. Schamhardt, G. J. van Osch, A. J. van den Bogert, 1993). The thrust generated by the hind legs travels forward through the thoracolumbar spine where it is submitted to the attraction of gravity and a percentage of the thrust loads the forelegs. The front limbs compensate for the loading effect of the hind legs’ propulsive force, propelling the body upward and forward. Between the hind and the front limbs, the back muscles have the capacity to convert a percentage of the thrust generated by the hind legs into upward forces and consequently, reduce the load on the forelegs. “An initial thrust on the column is translated into a series of predominantly vertical and horizontal forces which diminish progressively as they pass from one vertebrae to the next”. (Richard Tucker, 1964). Classic authors understood that greater upward forces were necessary for collected and more elevated gaits such as passage. Albert Einstein praised intuitive minds over what he referred to as “faithful servants”. Even today, based on old theories, only intuitive riders are capable of filling in the gaps of the equestrian education. Instead, we observe that providing a sound explanation of the way the horses’ physique effectively works, many riders re-awake their intuition and are capable of moving beyond the limits created by an equitation of faithful servants. Instead of compression of the joints, the forces propelling the horse’s body forward are, for a great part, the outcome of an elastic strain energy stored in the tendons, aponeurosis, ligaments and muscles during the decelerating phase and reused for the propulsive phase and the swing. Instead of upgrading traditional beliefs to new knowledge, riders and trainers integrated new discoveries to antiquated views and often, researchers try compromises. The fact is that if the hind leg is a little more forward that under the vertical of the croup when the propulsive activity commences, it will be at the early stage of the propulsive phase and for a brief instant, a little more upward force. However, this type of thinking is more about preserving traditional beliefs than upgrading riding and training techniques. The hind legs ultimately generate a force in the direction of the motion that is converted through the muscular system of the back, into horizontal and upward forces. The engagement of the hind legs remains a necessity but for a different reason. At impact and during almost the first half of the stride, the supporting hind limb resist accelerations of gravity. This is part of balance control but depends more on the way the horse’s brain orchestrates the work of the decelerating hind leg than the position of the limb under the body. 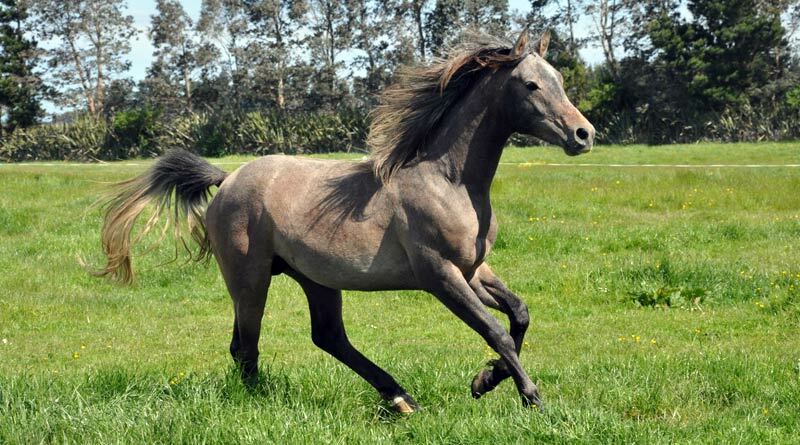 During piaffe for instance, the supporting hind leg is less forward under the belly than during collected trot, but the decelerating action is considerable. The decelerating phase of the hind leg is also the sequence where elastic strain energy is stored in the ligaments, fascia, tendons, aponeurosis and muscles, and reused for the propulsive phase and the forward swing of the limb. “The elastic energy stored in and recovered from tendons during cyclical locomotion can reduce the metabolic cost of locomotion” (Cavagna et al., 1977; Alexander, 1988; Roberts et al., 1997). Storage and reuse of elastic strain energy is a major component of efficient locomotion as well as performances and it is not limited to the advanced position of the hind leg under the body. During the first half of the stride, and therefore during the sequence of the stride where elastic strain energy is produced and stored, the fetlock translates downward before inverting the motion and then translating upward. The downward translation of the fetlock is referred to as dorsiflexion, while the upward translation is referred to as palmar flexion. During the dorsiflexion, the canon bone, (Mt3), achieves a screw-like motion. The twist induces an inward rotation at the other end of the bone, which is the hock joint. When flexion and extension of the joints are properly coordinated with inward rotation, the move is sound, effortless and classy. But when the synchronization between flexion and extension of the joints and inward rotations are not properly synchronized, shearing forces occur, rending the performance mechanical, restricted, difficult, painful and damaging. The fetlock and the hock are just examples. The function of the knee, the stifle, the elbow and even the thoracolumbar spine combine lateral bending, flexion, extension and rotation. Class is soundness and soundness is knowledge.